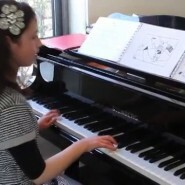 I often receive requests to take a minute to vote for a person or organization competing to win an internet contest, so when I opened yet another request like that this morning to vote for a competitor in Chabad.org’s Jewish Kids Got Talent, I was surprised to discover a special young competitor, Rochel Szmerling of Melbourne, who moved me to tears. Why does her video move me so much? I think there are two reasons. First, I love that she sits up there in front of a whole crowd of people to play her relatively simple songs, and how much joy these simple songs bring to the elderly people and Holocaust survivors in the audience. Which reminds me: I don’t have to be perfect to make the world a better place. All I need is a good heart and the determination to do small acts of kindness. The sum total of all of our small acts of kindness is HUGE. And second, this video of Rochel Szmerling, the ninth of nine children, reminds me of something a famous rebbetzin once said about having large families. She explained that while it’s true that the world is overpopulated, there is still a dire lack of human beings who are givers rather than takers. And seeing Rochel Szmerling using her songs to give to others makes me feel so proud to be a Jew and hopeful for the future of a nation full of so many givers like her. You always amaze me with each of your blogs. I get so much nachas from reading them and experience the never-ending holiness of the human being, especially stories of the Jewish people. May Hashem continue to give you strength to share your wonderful stories with us all. And may He continue to Bless your beautiful family. Sending Love, Admiration, and Good Wishes for a SHABBAT SHALOM.